Take me out to the Ballgame! 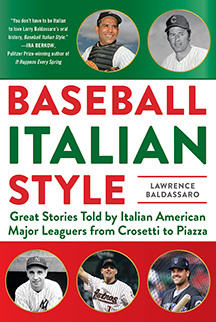 Baseball Italian Style - Great Stories Told by Italian American Major Leaguers from Crosetti to Piazza by Lawrence Baldassaro is the perfect read to get in the spirit of the upcoming baseball season. Whether you or someone you know loves the history of the game or just loves all things related to baseball, author and professor emeritus of Italian at the University of Wisconsin-Milwaukee, Lawrence Baldassaro and 40 of baseball's greatest Italian players will resonate soundly with fans as they hit it out of the ballpark with this book featuring their interesting backstories. Timed to coincide with baseball's major league baseball Spring training and the upcoming baseball season, Baseball Italian Style - Great Stories Told by Italian American Major Leaguers from Crosetti to Piazza by Lawrence Baldassaro, release date March 6, 2018, is the perfect pre-game warm-up and makes a wonderful gift for yourself or for your favorite baseball fan. The book follows the careers of the great Italian baseball players beginning in the 1930s with Frank Crosetti, Phil Cavarretta, Angelo "Tony" Giuliani, Nino Bongiovanni, Dario Lodgiani, and Sibby Sisti, and follows with stories from players from the 1940s, 1950s, 1960s, 1970s, 1980s, 1990s, 2000 - 2009, and ends in 2010 with Anthony Rizzo. I loved reading the "backstories" about "how and why" these tremendous talents chose to play baseball and make it a career, and the book is a chock-filled treasure chest with all bases loaded with their interesting anecdotes about what it meant to them and their families and what it was like to play during their careers. Over the course of reading the book, I learned about some of the most famous and influential names in baseball including Joe DiMaggio and Yogi Berra (the 1940s), Tommy Lasorda (the 1950s), Joe Torre and Bobby Valentine (the 1960s), Larry Bowa (1970s), Mike Scioscia (the 1980s), Mike Piazza and Joe Garagiola, Jr. (1990s), Barry Zito (the 2000s), and many more. Although I was well familiar with Joe DiMaggio and his stellar baseball career, reading the book I learned that the DiMaggio family was "baseball royalty" as not only Joe played, but his younger brother Dom DiMaggio (the 1940s) and older brother Vince DiMaggio (the 1930s and 1940s) also had major league careers, and the DiMaggio family was not the only family with "double hitters" playing in the major leagues. From players to coaches, to managers, to Hall of Famers, and scouts, their accomplishments created lasting legacies in the world of baseball. With baseball's Spring training in full swing and the upcoming baseball season just around the corner, I know that you will enjoy reading Baseball Italian Style - Great Stories Told by Italian American Major Leaguers from Crosetti to Piazza by Lawrence Baldassaro, as much as I did. The book is available in bookstores and online, including: Amazon and Barnes & Noble. © March 2018.Luxury Experience. www.LuxuryExperience.com.All rights reserved.